How can we thank you enough for creating the wedding of our dreams?! The service you provided surpassed every expectation that we had for a destination wedding. Without your knowledge and expertise, we could not have arranged an event or holiday of that calibre; it was truly amazing. Your recommendations for accommodation were fantastic. You understood exactly what we required in terms of vicinity and value. Our guests are still raving about the beautiful locations, delicious breakfasts, tasty cocktails and the quality of service we received at each of our chosen venues. What made our wedding so special was the fact that all our guests were so relaxed and completely in holiday mode – and this is thanks to your attention to detail in arranging their individual bookings, and your personalised correspondence with any concerns or questions they had. Your tips and advice for restaurants and tourist info was also very much appreciated. Having been in a number of bridal parties, we’ve seen how a wedding day can be a stressful event for the bride, groom and their families – but not so for us! The day of the wedding went so smoothly. All of your behind the scenes organising and running around meant that we were relaxed and happy and could enjoy the process of getting ready with the hair and make-up artist, photographer and videographer that you had arranged (all of which were highly skilled an produced amazing results!) There was not a single detail you had not thought of. The ceremony and reception set up you designed and put together were nothing short of breathtaking. Somehow you captured the exact ‘look’ we were going for. The flowers, the lighting, the little touches you thought of all came together to create the most luxurious and beautiful wedding set up we have ever seen. All of this combined with the picturesque location you had recommended for our vows and party, felt like we were literally in a postcard! In fact, I’m sure our guests took just as many photos of the set up as they did of us! We had the holiday of a lifetime, and a wedding that no-one will forget. From the bottom of our hearts, thank you. 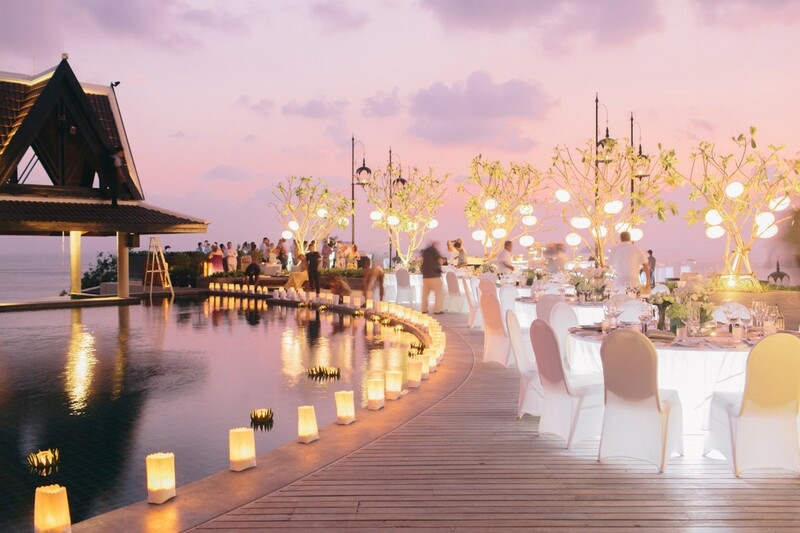 For anyone considering a destination wedding in Thailand, we cannot sing your praises enough! Just wanted to tell you what a wonderful time we had at the wedding and that it was everything that Kaiti had hoped for. The flowers, the table settings, the food, the resort, it was all just beautiful. Everyone is still raving about what a great time they had and finding it very hard to return to “normal”! Can’t wait to see the official photos and video, the ones we have are lovely with the elephant, the sunset, the food etc. I could just keep going on and on but I’ll just say thank you again, it was truly beautiful.